This is a busy time of year for many farmers, but taking time to winterize your sprayer now can payoff in avoiding problems next spring. Without proper winterizing before the temperature falls below freezing, you could end up with a pump that is cracked and/or not working at its full capacity. Here are some important things you need to do with your sprayer this time of the year. Make sure to rinse the whole sprayer thoroughly before storing. Rinsing the sprayer thoroughly after each use reduces likelihood of cross-contamination of products applied next spring. Insufficient rinsing may also result in clogged nozzles. Once the nozzles are clogged, it is extremely difficult to bring them back to their normal operating conditions. Leaving chemical residues in nozzles will usually lead to changes in their flow rates, as well as in their spray patterns resulting in uneven distribution of chemicals on the target. Depending on the tank, proper rinsing of the interior can be challenging. Rinsing is easy if the tank is relatively new and equipped with special rinsing nozzles and. If this is not the case, manual rinsing of the tank interior is more difficult, and poses some safety problems such as inhaling fumes of leftover chemicals during the rinsing process. To avoid these problems, either replace the tank with one that has the interior rinse nozzles, or install an interior tank rinse system in your existing tank. 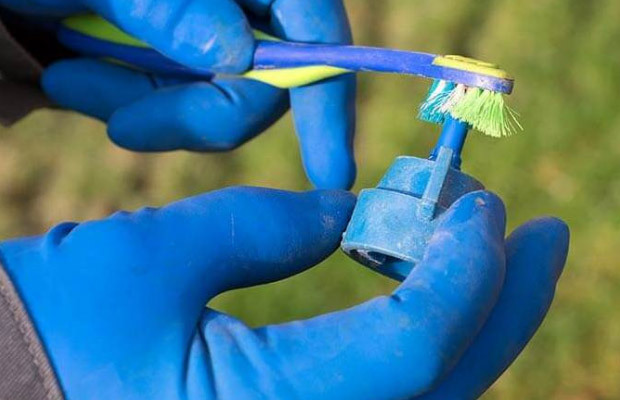 For effective rinsing of all the sprayer components, circulate clean water through the whole sprayer for several minutes with the nozzles off, then flush out the rinsate through the nozzles. Rinsing should be done in the field, or on a concrete chemical mixing/loading pad with a sump to recover rinse water. Dispose of the rinsate according to on the directions on the labels of the pesticides in the tank. Always check the label for specific instructions. Most labels recommend following procedure: If rinsing is done on a concrete rinse pad with a sump, put the rinsate collected in the sump back in the tank, dilute it with water and spray it in the field where there is no potential for the rinsate to reach ditches and other water bodies nearby. If the rinsing is done in the field, make sure you are not flushing out the rinsate in the system in one area. It is best to further dilute the rinse water in the tank and, spray it on the field on areas where there is no potential for the rinsate to reach ditches and other water bodies nearby. Rinsing the system with water as explained above may not be sufficient to get rid of chemicals from the sprayer. This may lead to cross-contamination problems. 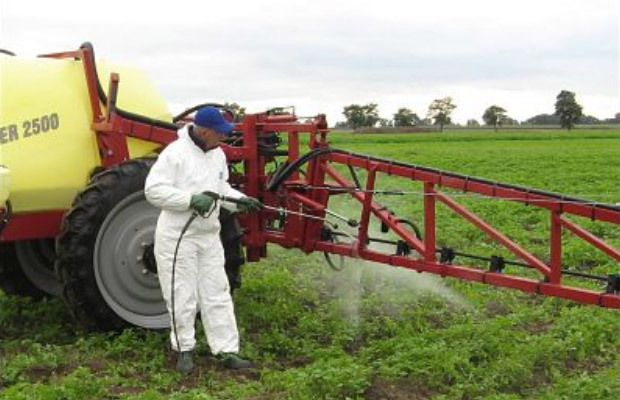 Residues of some pesticides left in the sprayer may cause serious problems when a spray mixture containing these residual materials is applied on a crop that is highly sensitive to that pesticide. To avoid such problems, it is best to clean and rinse the entire spraying system with cleaning solution. A mixture of 1 to 100 of household ammonia to water should be adequate for cleaning the tank, but you may first need to clean the tank with a mixture containing detergent if tank was not cleaned right after the last spraying job was done. Some chemicals require specific rinsing solution. Always check the product label to find out the most recent recommendations on cleaning agents. Cleaning the outside of the sprayer components deserves equal attention. Remove compacted deposits with a bristle brush. Then flush the exterior parts of the equipment with water. A high pressure washer can be used, if available. Wash the exterior of the equipment either in the field away from ditches and water sources nearby, or a specially constructed concrete rinse pad with a sump. Again, the rinsate should be disposed of according to the label recommendations. Most labels recommend the following practice: put the rinsate collected in the sump back in the tank, dilute it with water and spray it in the field where there is no potential for the rinsate to reach ditches and other water bodies nearby. To prevent freezing, check one more time to make sure there is no liquid left inside any of the sprayer parts. 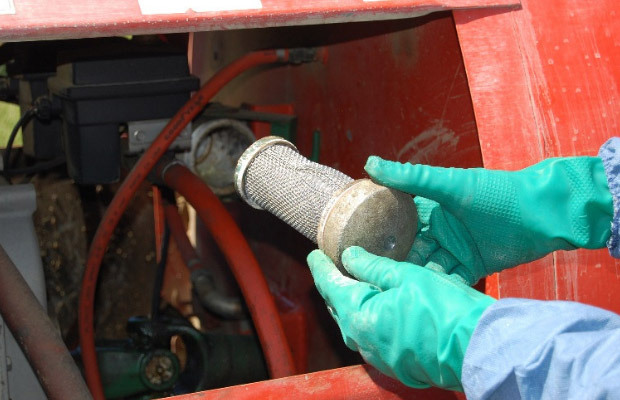 The pump, the heart of a sprayer, requires special care. After draining the water, add a small amount of oil, and rotate the pump four or five revolutions by hand to completely coat interior surfaces. Make sure that this oil is not going to damage rubber rollers in a roller pump or rubber parts in a diaphragm pump. Check the operator’s manual. If oil is not recommended, pouring one tablespoon of radiator rust inhibitor in the inlet and outlet part of the pump also keeps the pump from corroding. Another alternative is to put automotive antifreeze with rust inhibitor in the pump and other sprayer parts. This also protects against corrosion and prevents freezing in case all the water is not drained. To prevent corrosion, remove nozzle tips and strainers, dry them, and store them in a dry place. Putting them in a can of light oil such as diesel fuel or kerosene is another option. Find ways to protect your sprayer against the harmful effects of snow, rain, sun, and strong winds. Moisture in the air, whether from snow, rain, or soil, rusts metal parts of unpro­tected equipment of any kind. While the sun usually helps reduce moisture in the air, it also causes damage. Ultraviolet light softens and weakens rubber materials such as hoses and tires, and degrades some tank materials. The best protection from the environment is to store sprayers in a dry building. If storing in a building is not possible, try covering the sprayer with some material that will protect it from sun, rain and snow. When storing trailer-type sprayers, put blocks under the frame or axle and reduce tire pressure during storage. Finally, check the condition of all sprayer parts one more time before leaving the sprayer behind. Identify the parts that may need to be worked on, or replaced. Check the tank and hoses to make sure there are no signs of cracks. Check the painted parts of the sprayer for scratched spots. Touch up these areas with paint to eliminate corrosion. Don’t forget to cover openings so that birds don’t make a nest somewhere in your sprayer, and insects, dirt, and other foreign material cannot get into the system. The Ohio Soybean Council is funded and directed by the state’s soybean farmers. Its mission is to support research, education and promotion efforts that advance farming practices and build markets for our soybean products.